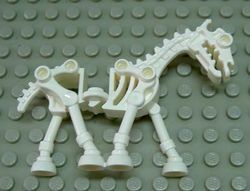 A Skeletal Horse is a dead horse resurrected from the dead by the Evil Wizard. They are seen in many Castle (2007) sets. They appeared in black and white. It also appears in the theme Monster Fighters in set 9462 (Monster Fighters). It is unknown whether the skeletal horse in set 9462 (Monster Fighters) is Phosphorescent Green or transparent fluorescent green. In the Harry Potter theme, the black skeletal horses were given wings to represent Thestrals, magical creatures that can only be seen by people that have seen other humans die. They appeared as only in 5378 Hogwarts Castle.